On a summer day, several dedicated volunteers unlock the doors of an abandoned church in Alviso, and begins cleaning and repairing. Their efforts and the dedicated support of several churches from Sunnyvale to San Jose transform the empty, run-down, building into the bring and lively Alviso Day Care Center. Its mission is to provide quality childcare for low-income families in the Alviso community. The first Director of Alviso Day Care, Doris Martinson, focuses on setting and achieving high standards for child care, children's educational programming, employment opportunities for the community, and educational opportunities for the staff. United Way of Santa Clara County begins providing funding. More credentialed teachers are added to the Alviso Day Care staff and the Center expands its enrollment to families beyond Alviso. In January, Alviso suffers a disastrous flood. While the rain is still falling, a National Guard amphibious vehicle carries Doris Martinson out into the floodwaters to inspect the church. She is forced, sadly, to conclude that the building is beyond restoration. The entire staff begins searching for a new site and within days have a temporary agreement with Agnews Developmental Center in Santa Clara. Soon that agreement changes to a yearly lease, and the Center has a new home. The staff, friends, family, and other supporters transform the abandoned dormitory for the mentally ill into rooms filled with learning, laughing, and imagination. Bright, cheery curtains cover the heavy wire mesh panels on all the windows. Doris Martinson retires and Margaret Fisher, who has been with the Center since 1970, becomes the new Director. 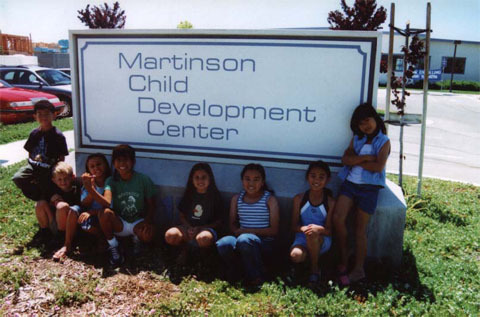 Margaret and the Board of Directors vote to change the name to the Martinson Child Development Center (MCDC), in honor of Doris Martinson's years of dedicated service. The larger size of the Agnews facility provides the opportunity for the center to expand over the next few years. State of California announces the sale of Agnews West Campus. MCDC works with the State and the new owners, Rivermark and Sun Microsystems, on a plan to relocate the Center. The result is a new building at a new location, but the Center has to commit to purchase it within five years. Construction of a new facility begins, but the Center now has the task of raising $1.5 million. Martinson Child Development Center opens the doors of its new facility at 1350 Hope Drive in Santa Clara. The Center then begins its first major Capital Development Campaign. But after a promising start, the campaign stalls when it collides with the economic collapse of 2001. As the deadline approaches, the Center has few options and faces imminent closure. Fortunately, the City of Santa Clara becomes aware of the situation and acts quickly to purchase the facility from the State, and to ensure that the Center continues to provide its valuable services to the community. The City of Santa Clara leases the facility to MCDC under a long-term agreement. After 35 years of service, including 20 years as Director, Margaret Fisher passes away. Rosie Limos, who joined the Center as a teacher in 1993, is appointed the new Director.